Prazomax 20 capsule: Each capsule contains Omeprazole BP 20 mg as enteric coated pellets. Prazomax 40 capsule: Each capsule contains Omeprazole BP 40 mg as enteric coated pellets. It is a proton pump inhibitor that suppresses gastric acid secretion by specific inhibition of the H+/K+-ATPase in the gastric parietal cell. By acting specifically on the proton pump, Omeprazole reduces gastric acidity by blocking the final step in acid production. • Benign gastric and duodenal ulcer • NSAID associated duodenal or gastric ulcer and gastroduodenal erosions • Gastro-esophageal reflux disease • Duodenal or benign gastric ulcer associated with Helicobacter pylori • Prevention of relapse in gastric ulcer • Prevention of relapse in duodenal ulcer • Erosive esophagitis • Zollinger-Ellison Syndrome • Gastric acid reduction during general anesthesia • Acid-related dyspepsia. Omeprazole should be taken before meal. Omeprazole is well tolerated. The adverse events are diarrhea, headache, flatulence, abdominal pain, constipation and dizziness/vertigo. Hypersensitivity to Omeprazole or any of the components of this medication. Pregnancy: The safety of Omeprazole in pregnancy has not been established. It should not be administered to pregnant women unless the expected benefits outweigh the potential risks. Lactation: It is not known if Omeprazole is secreted in human milk. It should not be given to nursing mothers unless its use is considered essential. Pediatric use: The safety and effectiveness of Omeprazole for the treatment of Gastro-esophageal reflux disease in patients < 1 year of age have not been established. The safety and effectiveness of Omeprazole for other pediatric uses have not been established. Omeprazole can delay the elimination of diazepam, phenytoin and warfarin. There is no evidence of interaction with theophylline, propranolol, metoprolol, lidocaine, quinidine, amoxicillin or antacids. The absorption of Omeprazole is not affected by alcohol or food. Prazomax 20 capsule: Each box contains 10X10’s capsule in blister pack. 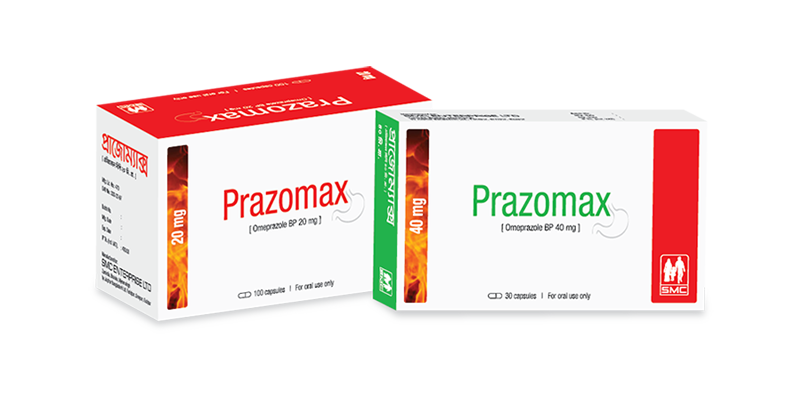 Prazomax 40 capsule: Each box contains 3X10’s capsule in blister pack.